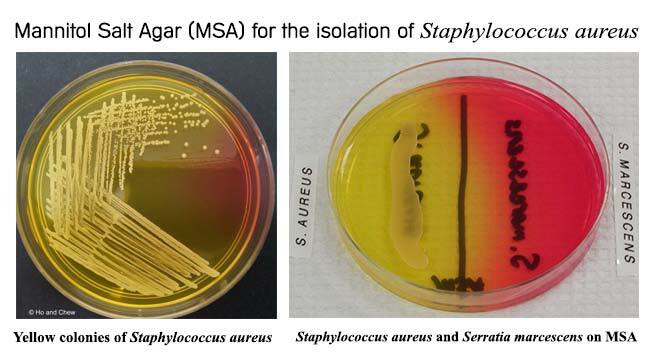 Mannitol Salt Agar (MSA) is used as a selective and differential medium for the isolation and identification of Staphylococcus aureus from clinical and non-clinical specimens. It encourages the growth of a group of certain bacteria while inhibiting the growth of others. It is a selective medium prepared according to the recommendations of Chapman for the isolation of presumptive pathogenic staphylococci. Final pH 7.4 ± 0.2 at 25°C. Mannitol Salt Agar contains peptones and beef extract, which supply nitrogen, vitamins, minerals and amino acids essential for growth. The 7.5% concentration of sodium chloride results in the partial or complete inhibition of bacterial organisms other than staphylococci. Sodium chloride also supplies essential electrolytes for transport and osmotic balance. Mannitol is the fermentable carbohydrate, fermentation of which leads to acid production, detected by phenol red indicator, aids in the differentiation of staphylococcal species. Coagulase positive staphylococci (e.g., Staphylococcus aureus) produce yellow colonies and a surrounding yellow medium while coagulase negative staphylococci produce red colonies and no color change of the phenol red indicator. Agar is the solidifying agent. Addition of 5% v/v Egg Yolk Emulsion enables the detection of lipase activity of staphylococci along with mannitol fermentation. The salt clears the egg yolk emulsion and lipase production is detected as yellow opaque zone around the colonies. Suspend 111.025 gm of MRS media in 1000 ml of distilled water. Boil to dissolve the media completely. Autoclave at 121°C for 15-20 minutes. Cool to 45-50°C and pour into petri dishes. Staphylococcus aureus Yellow colonies with yellow zones. Staphylococci other than S. aureus (e.g. Staphylococcus epidermidis ) Colorless or Red colonies with red zones. Streptococci No growth to trace growth. Micrococci Large white to orange. Gram-negative bacteria No growth to trace growth. Negative Control: Escherichia coli ATCC 25922, Partial to Complete Inhibition. Mannitol Salt Agar. Biokar Diagnostics – Rue des Quarante Mines – ZAC de Ther – Allonne – B.P. 10245 – F60002 Beauvais Cedex – France. Mannitol Salt Agar. PML Microbiologicals, Inc.
Mannitol Salt Agar. Acumedia Manufacturers, Inc.
Mannitol Salt Agar. Liofilchem SRL. BD Mannitol Salt Agar. Becton Dickinson GmbH. You please tell me… How process can I measurements the antimicrobial sensitivity test of Staphylococcus aureus??? Which process or method can I following for the sensitivity test of Staphylococcus aureus?????? I kindly requested to you, please you response me. If the organism in MSA ferments mannitol and forms yellow colonies, can we directly assume it as S.aureus or we have to further sub culture in nutrient agar and do biochemical tests? What is the ideal method? Please explain this. what are the effects of using too much higher amount of MSA with 250ml of distilled water?